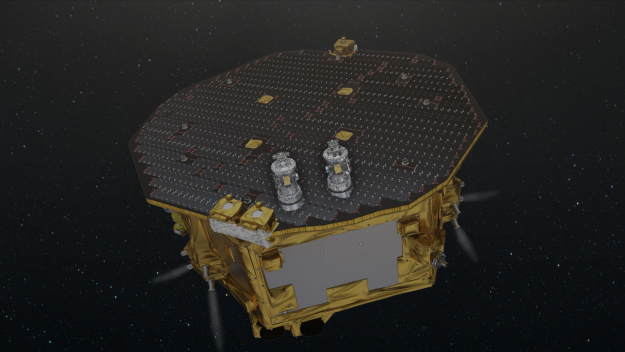 LISA Pathfinder operates 1.5 million km from Earth towards the Sun, orbiting the first Sun–Earth ‘Lagrangian point’, L1. At the core of the spacecraft are the two test masses: a pair of identical 46 mm gold–platinum cubes, floating freely, several millimetres from the walls of their housings. The cubes are separated by 38 cm and linked only by laser beams to measure their position continuously. During the science operations phase, microthrusters will make minuscule shifts in order to keep the spacecraft centred on one of the masses. This will isolate the two cubes from all external and internal forces except gravity, placing them in the most precise freefall ever obtained, in order to test technologies for future observations of gravitational waves from space.